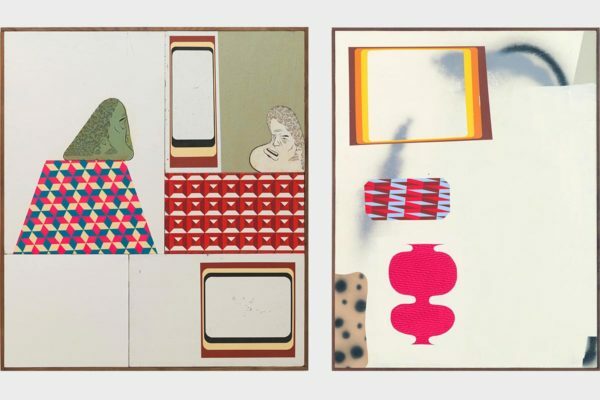 From left to right: Barry McGee, Untitled, 2017, Acrylic and gouache on panel, 5 elements, 36.5 x 32.5 x 1.75 in., Courtesy Ratio 3, San Francisco, and Cheim & Read, New York. Barry McGee, Untitled, 2017, Acrylic, gouache, and aerosol paint on panel, 63 x 49.25 x 1.75 in., Courtesy Ratio 3, San Francisco, and Cheim & Read, New York. Join us at Museum of Contemporary Art Santa Barbara for an opening reception celebrating our new summer exhibition, Barry McGee: Mid Summer Intensive! This solo exhibition will feature a sprawling installation of paintings, drawings, and sculptural objects by San Francisco, CA-based artist Barry McGee. McGee embraces improvisation as a guiding principle in his work, finding a balance between chaos and meticulous attention to detail. Constellations and groupings of drawings and sculptures are juxtaposed against found objects, ephemera, and collected works by other artists. McGee’s multilayered imagery is born out of elements of the urban experience, including issues of identity, homelessness, and pointed critiques on consumerism and commercialism. While McGee's exhibitions have taken many different forms, each is marked by the artist's characteristically immersive environments and a subtle, yet deft responsiveness to their geographic and social context. As with past exhibitions, McGee's installation at MCASB will reflect its surrounding environment and the particular histories of the region; references to Santa Barbara's past and cultural oddities like the The Reagan Ranch Center will inform this dynamic exhibition. In advance of the exhibition opening, McGee has invited Noriyuki Ushio, owner of Scooters for Peace, to host a pop-up shop featuring limited edition works designed by artists, including McGee, as well as handcrafted Japanese items and vintage goods. The shop will be open to the public at 723 Paseo Nuevo (located between Paseo Nuevo Parking and California Pizza Kitchen) June 28 through July 1. McGee has also partnered with professional skateboarder Elissa Steamer to create two limited edition beach towel designs that will be available for purchase at MCASB for the duration of the exhibition. Special thanks to exhibition sponsors RVCA and Scooters for Peace. You will be taken to Nighout to RSVP.